BIOselect® was founded in 2002 in the city of Rethymno, on the Island of Crete. Our company is specialized in the production and distribution of organic cosmetics in Greece and abroad. Crete is a prosperous land with mild Mediterranean climate and an abundant natural habitat. Many of the plants and herbs prosper only in the land of Crete, and are known since the ancient times for their exceptional medicinal as well as cosmetic qualities. The organic ingredients that are derived from them, offer a mild– yet complete and effective solution for everyday skincare needs. The natural prosperity of the Greek land, the unique benefits of the organic and natural ingredients found solely in the island of Crete, as well as the natural beauty remedies preserved since antiquity, were the driving force that created BIOselect® Organic Cosmetics. 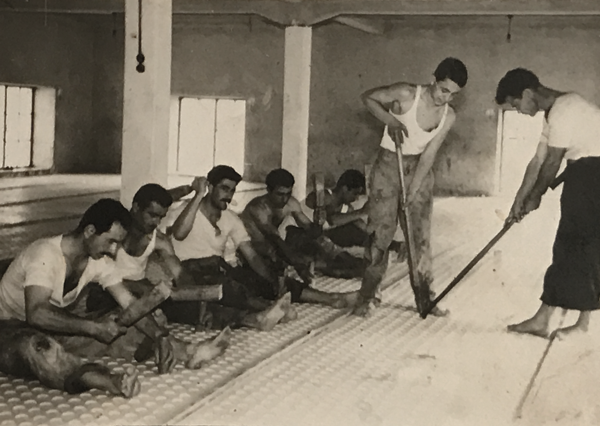 Old soap factory in Rethymno (1953) during the soap sealing and cutting process on the factory's "tabacas"* plates. Our products are produced with love and respect for the environment, and the ingredients that are gathered from the land of Crete. BIOselect® Organic Cosmetics are created from recipes using selected natural ingredients, and mostly biologically cultivated raw materials. Comprised of professional chemists, perfumers, and experienced herb gatherers, our experienced team shares the same values and enthusiasm, and together we are set to explore new ideas in order to provide you with the best organic skincare solutions. In 2002 our company started the production and distribution of high quality biologically cultivated nutritional products from Crete, such as extra virgin olive oil, aromatic herbs, and honey. In 2005, in response to the Greek and global market rising needs for organic cosmetics, we created the certified line of organic cosmetics BIOselect® , which was distributed throughout selected pharmacies and bio stores in Attika, Thessaloniki, and Crete. In 2006, we developed our first international commercial partnership, and up until today we are being represented in: Russia, Italy, Norway, Denmark, Germany, USA, UK, Cyprus, Poland, Spain, Lithuania, France, Hungary and Austria.